Sky Crane in aerial ballet mode during the descent of NASA’s Curiosity rover to the Martian surface. Editor's Note: NASA's Curiosity Rover successfully touched down on the Martian surface on Aug. 5, 2014, and has been exploring the Red Planet ever since. The following timeline was updated on March 8, 2016. NASA's newest Mars rover — a car-size robot that will scour the Martian surface for signs that the planet could have supported life — will make a thrilling and unprecedented landing on the Red Planet next month. The $2.5 billion Mars Science Laboratory, or Curiosity rover, is scheduled to touch down on Mars on the night of Aug. 5. The rover's entry, descent and landing from the top of the Martian atmosphere have been nicknamed the "seven minutes of terror." 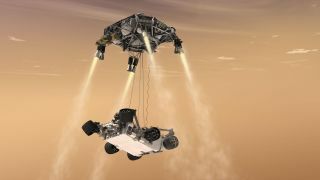 Since the 1-ton rover is too big for airbags to cushion its landing, Curiosity is equipped with a rocket-powered sky crane to lower it to the surface. Once Curiosity touches down, cables will release the sky crane, which will fly off and crash-land a safe distance away from the rover. Mars 2: (FAILED) USSR, launched May 19, 1971. The Mars orbiter and lander arrived on Nov. 2, 1971, but returned no useful data, and the lander burned up due to steep entry. Mars 3: (FAILED) USSR, launched May 28, 1971. The Mars orbiter and lander arrived on Dec. 3, 1971. The lander operated on the surface of Mars for 20 seconds before failing. Mars 6: (FAILED) USSR, launched Aug. 5, 1973. The Mars flyby module and lander arrived on March 3, 1974 but the lander failed due to a fast impact. Mars 7: (FAILED) USSR, launched Aug. 9, 1973. The Mars flyby module and lander arrived on March 3, 1974 but the lander missed the planet. Viking 1: U.S., launched Aug. 20, 1975. The Mars orbiter operated from June 1976 to 1980 and the lander operated from July 1976 to 1982. Viking 2: U.S., launched Sept. 9, 1975. The Mars orbiter operated from Aug. 1976 to 1987, and the lander operated from Sept. 3, 1976 to 1980. Combined, the Viking orbiters and landers returned more than 50,000 photos. Phobos 2: (FAILED) USSR, launched July 12, 1988. The Mars orbiter and Phobos lander were lost in March 1989 near Phobos. Mars 96: (FAILED) Russia, launched Nov. 16, 1996. The orbiter, two landers and two penetrators were lost after the rocket failed. Mars Pathfinder: U.S., launched Dec. 4, 1996. The Mars lander and rover landed on July 4, 1997 and communicated with ground teams last on Sept. 27, 1997. Mars Polar Lander/Deep Space 2: (FAILED) U.S., launched Jan. 3, 1999. The lander and two penetrators were lost on arrival in December 1999. Beagle 2: (FAILED) European Space Agency, launched June 2, 2003. Beagle 2 launched on ESA's Mars Express orbiter, which complet­ed its prime mission in November 2005 and is currently on an extended mission. The Beagle 2 lander. however, was lost on arrival on Dec. 25, 2003. Mars Exploration Rover Spirit: U.S., launched June 10, 2003. The Mars rover landed on the Red Planet on Jan. 4, 2004 for three-month mission to look for signs of past water activity on Mars. Ground controllers lost communication with Spirit in March 2010, and repeated attempts to awaken the rover failed. The rover far outlived its intended warranty, and is considered a success. NASA declared Spirit dead in May 2011. Mars Exploration Rover Opportunity: U.S., launched July 7, 2003. The Mars rover landed on Jan. 25, 2004 for a three-month prime mission in the Meridiani Planum region. The rover has currently logged more than 20 miles on the Red Planet and is now investigating the huge Endeavour crater. Phoenix Mars Lander: U.S., launched Aug. 4, 2007. The Mars lander touched down on May 25, 2008 and dug through Martian soil to confirm the presence of water ice beneath the surface. Phoenix's solar panels suffered severe damage from the harsh Martian winter, and communication with the $475 million lander was lost in November 2008. After repeated attempts to reestablish contact, NASA declared Phoenix broken and dead in May 2010. Phobos-Grunt: (FAILED) Russia, launched Nov. 8, 2011 on a mission to return samples from the Mars moon Phobos. The $163 million robotic probe suffered a crippling malfunction shortly after launch, stranding it in Earth orbit. Mission managers said Phobos-Grunt spacecraft's thrusters failed to fire in a maneuver that would have sent the spacecraft on to Mars. The spacecraft plummeted back to Earth and was destroyed on Jan. 15, 2012. Mars Science Laboratory: U.S., launched Nov. 26, 2011. The $2.5 billion Curiosity rover landed at Gale crater on the night of Aug. 5, 2012, and will investigate the mountain at its center with exposed rock faces that represent various periods in Mars' geologic history.The Mars rover will also investigate whether the planet was ever hospitable to life.